Unlike other furniture stores in the Coachella Valley, we offer a wide variety of unique home furnishings with the convenience and economy of consignment prices. Our vast showroom spans over 23,000 square feet and is filled with elegant dining room furniture that can completely transform your space to be both functional and beautiful. 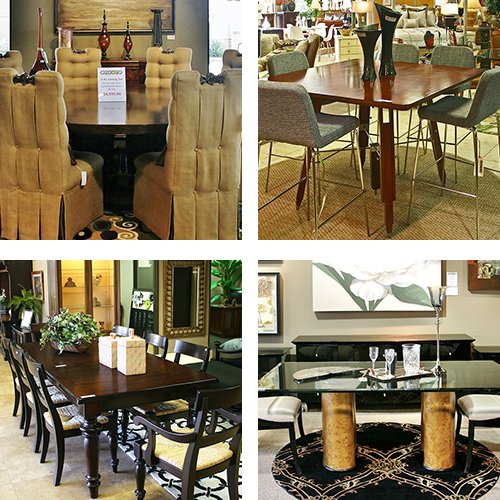 We invite and encourage you to decorate your living room at our dining room furniture store. If you have unused or gently used dining room furniture in your home that you would like to see in our furniture store, we are happy to help. Our staff of talented designers will be able to assist you in all of your consignment needs. When you choose to consign your furniture with us, you will have the ability to leverage our extensive marketing platform to ensure you find the right buyer. Avoid the complications and risks of direct selling by consigning your furniture with us. To learn more or to get started, please click on the button below. At Encore Consign + Design, we have completely revolutionized the way you shop for furniture. We have a vast showroom that spans over 23,000 square feet, full of some of the most amazing designer-inspired furniture. Our staff of design specialists and interior designers will ensure that you find exactly what you are looking for or will help you visualize your ideas into a real design concept right in our showroom. At Encore, it is our mission to make it easier than ever before to create the dining room of your dreams.